My first year of con was a complete success. I found a niche where I belong amongst people of my kind. WOOO HOOOO! 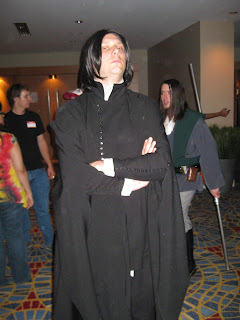 At the con I found a few track rooms out of the main thoroughfare and yet they had things I wanted to be a part of. This area became a meeting place for me and everyone I went to con with. Since this was our meeting spot, I inevitably wandered into these track rooms rather frequently and instantly fell in love with one of the rooms. One of the other rooms kind of irritated me and I will tell you why. The track volunteers (all tracks of programming are run by volunteers--yay and thank you) talked (and rather loudly) through all of the panels I went to in that room. Kind of annoying, really. I found most of their topics of discussion really intriguing and wanted to hear them. At one point I kept looking over at the staff table and saying shhhhhh. This was of course to no avail. Oh well. One day, I went into a panel in the shhhing room. I truly have no idea what the panel was about but the discussion was something to do with fantasy. A new friend of mine brought up The Wizard of Oz. Her point was instantly shot down by one of the panelists who happened to be the assistant track director. The audience and my friend were all like WTF? The Wizard of Oz is one of the most impactful fantasy movies of all time. Needless to say, another friend of mine was also on the panel and quickly shot the other panelist down. I do not know if the panelist is stupid and did not know Wizard of Oz is fantasy, or if she just had a really big brain fart. I truly hope it is the latter. It has been many years and I have not seen the goober on another panel. I do not know if she is still involved with the track or not but, between telling her to shhhh and her not knowing the Wizard of Oz is fantasy, I am kind of glad I have not seen much of her since then. The poor thing had a big brain fart in front of a lot of people. I feel bad for her as I am not that great at speaking in front of groups of people either. At the time, I was irritated. I really was. Now as I look back, I think it is kind of funny. Even today, all of these years later, this is one of my favorite tracks and I love all of the people involved. Thank you to all of the track directors and volunteers who make Dragon Con what it is. Thousands of us thank you. 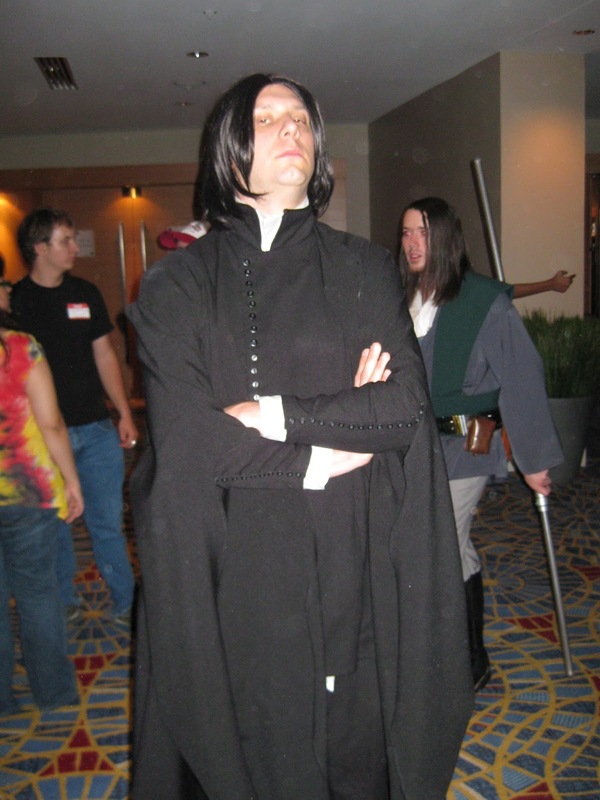 A pretty good Severus Snape. I had to stand up in line for this one.